For decades, astronomers have tried to pin down why two of the most common types of active galaxies, known as Type I and Type II galaxies, appear different when observed from Earth. Although both galaxy types host voracious supermassive black holes known as active galactic nuclei, which actively swallow matter and emit massive amounts of radiation, Type I galaxies appear brighter to astronomers' telescopes. New research from an international team of astronomers, with contributions from the University of Maryland, makes a major modification to a popular theory called the unified model. According to this model, the active nuclei of Type I and Type II galaxies have the same fundamental structure and energetic profile, but appear different solely because the galaxies point toward Earth at different angles. Specifically, Type II galaxies are tilted such that they are obscured by their own rings of dust, making Type I galaxies appear brighter by comparison. The new results, published September 28, 2017, in the journal Nature, suggest that Type I and Type II galaxies do not just appear different—they are, in fact, very different from each other, both structurally and energetically. The key factor that distinguishes Type I and Type II galaxies is the rate at which their central black holes consume matter and spit out energy, according to the researchers. "The unified model has been the prevailing wisdom for years. However, this idea does not fully explain the differences we observe in galaxies' spectral fingerprints, and many have searched for an additional parameter that fills in the gaps," said Richard Mushotzky, a professor of astronomy at UMD and a co-author of the study. "Our new analysis of X-ray data from NASA's Swift Burst Alert Telescope suggests that Type I galaxies are much more efficient at emitting energy." To conduct the study, Mushotzky and his colleagues re-examined data from 836 active galaxies detected by NASA's Swift Burst Alert Telescope that strongly emit high-energy, or "hard," X-rays—the same X-rays that medical technicians use to visualize the human skeleton. To measure the mass and growth rate of these galaxies' active nuclei—the supermassive black holes at the galaxies' centers— the researchers used data from 12 different ground-based telescopes spread across the globe to complement the data from the Swift satellite. "This project began in 2009, as part of my doctoral work at UMD, and has radically grown with the help of more than 40 researchers across the globe," said Michael Koss (M.S. '07, Ph.D. '11, astronomy), a research scientist at Eureka Scientific, Inc. and a co-author of the paper. "When I started out, I spent a month of lonely nights by myself at the Kitt Peak National Observatory observing a few dozen galaxies. I never dreamed we would eventually expand to such a large sample, enabling us to answer many amazing scientific questions for the first time." 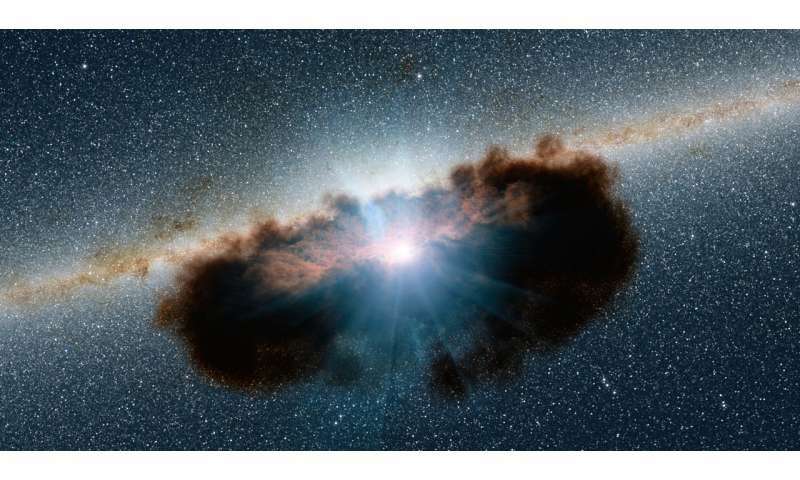 "Our results suggest this has a lot to do with the amount of dust that sits close to the central black hole," said Mushotzky, who is also a fellow of the Joint Space-Science Institute. "Type II galaxies have a lot more dust close to the black hole, and this dust pushes against the gas as it enters the black hole." For decades, astronomers preferentially studied Type II galaxies, largely because the active nuclei of Type I galaxies are very bright, making it difficult to see the stars and gas clouds that constitute the rest of the galaxy. Because the unified model suggested that all active galaxies were fundamentally the same, astronomers focused their efforts on the galaxies that host Type II active nuclei because they are easier to observe. The core star of Type I AGN has grown more massive and therefore more active at producing both new matter and new energy entering our observable subset of the larger universe deep within the core where conditions are most ripe. As such, it then has largely blown more of the otherwise obscuring gas and dust clear of the central region, exposing it to the eyes of the common merger maniac here on Earth. Type II AGN then have less massive and therefore less active cores, but still eject massive winds therefrom whose dust then congregate near the core, obscuring it from those same eyeballs who ponder the mystery of merger activity they have so come to worship without question.